San Francisco Elects City's First African-American Female Mayor London Breed is a native San Franciscan who grew up in public housing. Her opponent, a former state senator, would have been the city's first openly gay mayor. Mayor-elect London Breed waves before speaking to reporters on Wednesday outside City Hall in San Francisco. London Breed made history Wednesday as the first African-American woman to be elected mayor in San Francisco, the city where she grew up. Ballots were still being counted for more than a week after election day, but her opponent, former state Sen. Mark Leno, conceded the contest. Breed served as Board of Supervisors president for the city. She emphasized her humble beginnings during the campaign. Her grandmother raised her on a shoestring budget in public housing. In a victory speech on the steps of city hall, Breed challenged her supporters to strive for success. "No matter where you come from, no matter what you decide to do in life, you can do anything you want to do," she said. "Never let your circumstances determine your outcome in life." Breed will take the reins of a city enjoying a tech boom but suffering its consequences: spiraling real estate prices and a growing homeless population. KQED's Scott Shafer reported that Breed was one of three Democrat candidates for mayor and all three promised to address homelessness. Breed's approach was to clean up the streets, while Leno and city Supervisor Jane Kim emphasized adding more housing and shelters. Leno, 66, would have been the city's first openly gay mayor. The Associated Press reported that Leno said Breed "is going to do a very fine job. Her success is San Francisco's success." In her remarks Wednesday, Breed pledged to serve all of San Francisco. "I am prepared to do everything I can to work together to bring everyone together for the purposes of solving our most challenging problem," Breed said. 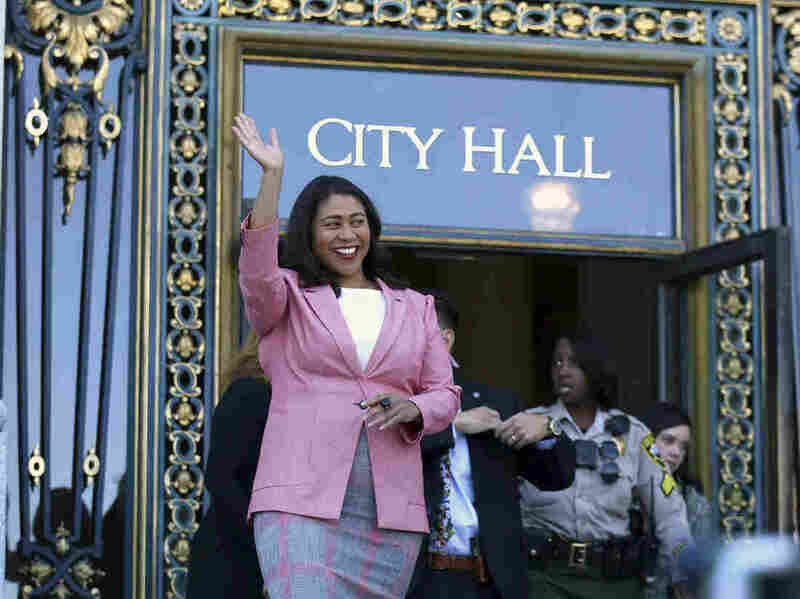 San Francisco Chronicle columnist Heather Knight noted that Breed's election as a black female mayor is particularly significant because of the city's "insane cost of living, which has driven out much of the black middle class." Breed succeeds the late Mayor Ed Lee, who died of a heart attack in December 2017. She will finish the remainder of his term, which ends in January 2020, and then face re-election. She is the second woman to become mayor of San Francisco. Democratic Sen. Dianne Feinstein first became mayor in 1978.